Honestly, I had not even heard of Sugarcane until we walked passed it on our way to Chica. Apparently, it's been open since November. I completely glossed over the menu on Three Square's page too. Had I seen it, I definitely would've been intrigued. 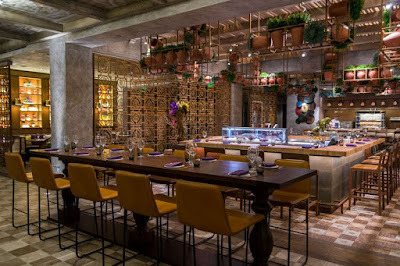 It turns out, Sugarcane is a miami-based restaurant by the same group that runs SushiSamba at the Grand Canal Shoppes. Menu items come from the raw bar, the grill or the kitchen. We received a sampling with the $40 Restaurant Week Menu. When our group of six arrived after having just walked out of Chica, Sugarcane's hostesses were friendly and accommodating despite having no reservations. We were seated at large table just off the grill. Our server was fantastic, she catered to our every need. We began with dishes from the raw bar. First was the Snapper Ceviche. The flavors were clean and fresh, the sweet potato provided a bit of sweetness and the crispy maiz gave the dish a crunchy bite. Second was the Salmon Poke which was my favorite. It was light, citrusy and just the right amount of salty. I loved the texture of the puffed rice. The Hokkaido Scallop Crudo was a tasty bite with apple and hint of black truffle. The kitchen prepared Brussels Sprouts that were positively addictive. So, much so we ordered an extra for the table to share. The Bacon Wrapped Date with linguca sausage was also a crowd pleaser. We enjoyed the meaty bite with the hint of sweetness. The Goat Cheese Croquettes were fried with a crispy exterior and a smooth creamy center. I have an aversion to goat cheese, but it looked so good I dug in to give it a try. However, I do no like goat cheese; no matter how well it's prepared or how often I try. Next up were items from the grill. 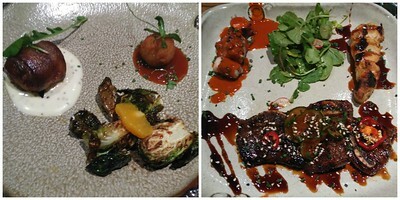 We sampled the Korean Short Ribs, Spanish Octopus and Chicken Breast with Yakitori sauce. I love octopus when it's done well. Unfortunately, the sauce was too assertive for such a delicate protein. The short ribs had good flavor, but it made me miss neighborhood Korean eateries. The chicken breast was the highlight. Great flavor, juicy and nice grill marks. It's quite rare when chicken is my favorite. They nailed it, though. We had quite the spread already and dessert was yet to come. 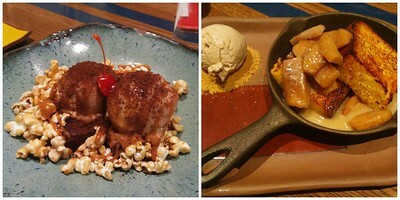 I was most excited for the Nutella Sundae, but it was the Torrejas that won me over. It is dulce de leche soaked french toast with carmelized apples and cinnamon ice cream. The french toast is truly outstanding. It's buttery rich and perfectly toasted with a soft center. It was a brioche to top all brioches. They soak it overnight and creme brulee the slices. A definite labor of love. Sugarcane was such a delightful surprise. I'm happy we stumbled upon it. Restaurant Week ends today, but Sugarcane and a select Venetian restaurants will be honoring the menu until July 7, there's still time to check out this amazing deal. Typically, I shy away from chains. However, there are a handful that deliver on quality food and top notch service. Joe's Seafood, Prime Steak and Stone Crab and CUT come to mind. Technically, Cleo, too, since it has locations in LA and Miami. 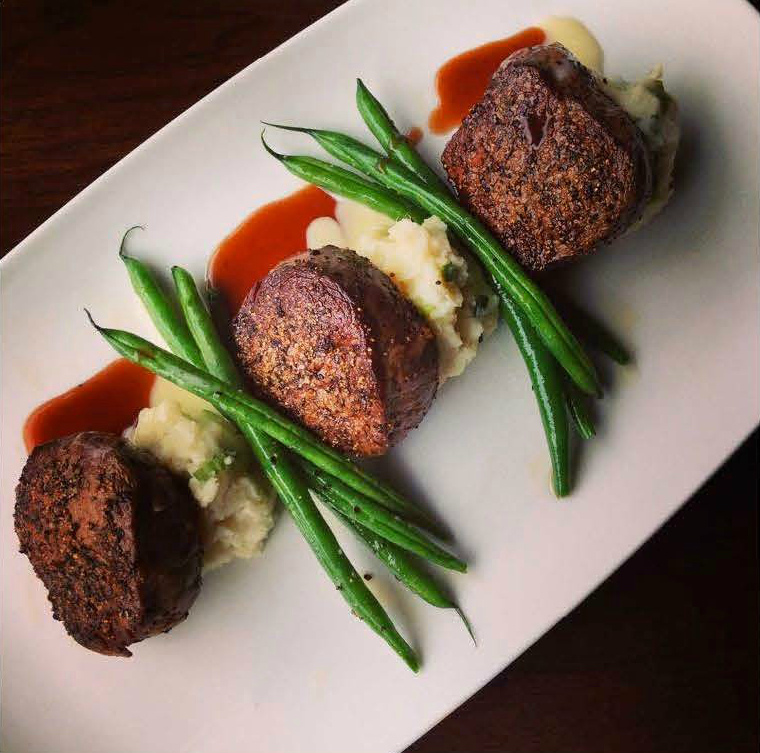 It might be too early to lump Del Frisco's Double Eagle Steakhouse in that group with only one meal under our belt, but our group agreed that our expectations were exceeded when we dined for Three Square's Restaurant Week. 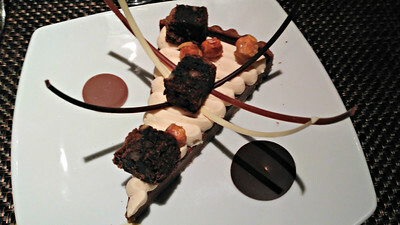 The $50 menu showcased several of the restaurant's most popular dishes. Around the table we had the Filet Medallions, Crab Cakes, the 16oz Prime NY Strip and the 8oz Filet Mignon. Our jovial table became silent once the food arrived, because we were chowing on the delicious spread. Everything was cooked to perfection and well seasoned. 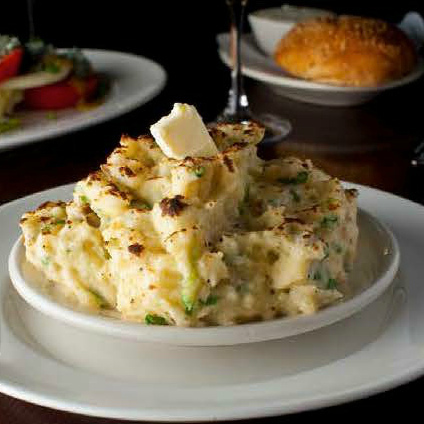 The side of green beans were fresh and garlicky and the potatoes were served mashed with skins with heaps of green onion. Just as we thought we had done all damage we could muster, we remembered dessert was on the way. 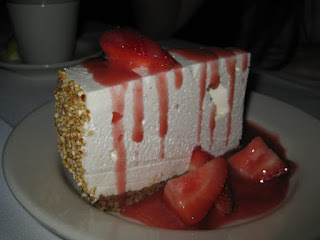 This strawberry cheesecake was stellar. There were no artificial flavors, only a punch of fresh ripened strawberries drizzled on top on the creamy whipped cheesecake. It was so light you'd think it came from the heavens. The pecan graham cracker crust might have been my favorite part. It was gone before I could truly decide. It's worth noting how comfortable the dining accommodations were, it has been a while since I wasn't restless by the end of the meal. I welcomed the practical in place of the stylish trends and the not too close tables, that allowed for easy conversation while we broke bread. This place drips mahogany from floor to ceiling, it's accented by white linen table cloths and leather dining chairs. Classic and clean, it'll make you yearn for the good ol' days. The dining room is made of several private dining areas, the main hall and bar. We were seated in the former smoking room equipped with a small humidor in the corner. Those that enjoy a good stick can still smoke on the outdoor patio. Time is nearly up on restaurant week, but Del Frisco's is currently running a three course meal on Sundays for $59. I may have to check it out. 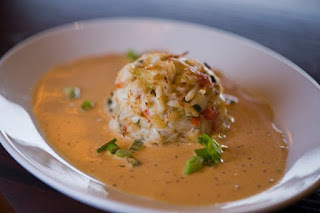 I hadn't heard of Chica until Three Square released the menus for Restaurant Week. 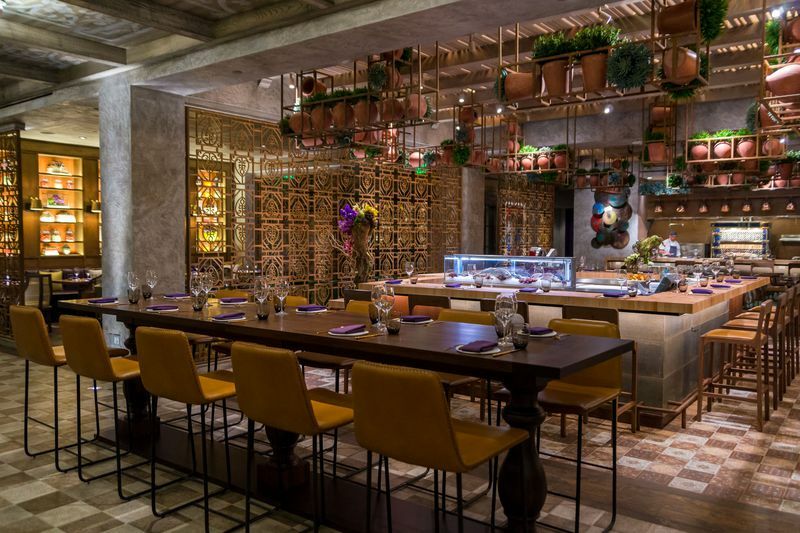 It opened in the space that was formerly Daniel Boulud Brasserie about six weeks ago. It's a partnership between Lorena Garcia, of Top Chef Masters fame, and 50 Eggs that operates the neighboring Yardbird. The $40 dinner menu sounded fantastic. I was easily sold when our friend made the suggestion, I quickly booked a reservation for six. That was a couple weeks ago. Last night, our group arrived promptly, I checked us in. The hostesses fiddled with their system for a few minutes before telling me that they'll grab us when a table is ready. About five minutes later, we were led to a large bar height table shared with another group. Bar height dining is terrible for short people. Our friend requested another table since the dining room was far from capacity. One large table was free, but the hostess said it was reserved for a group at the bar and nothing else was available. We reluctantly took our seats. We gazed at the menu and took notice the restaurant week menu wasn't provided. No waiter or waitress appeared for us, or the group at the other end of the table. We were left to graze on that line of how much time is acceptable to be greeted after being seated. Then, the manager approached the table, he confirmed that we preferred to relocate and said they were preparing a table for us. Perfect! Or, so, we thought. We waited and waited. We had nothing but time to study the fairly empty dining room that really didn't fit the expectation of a lively Latin American restaurant. The atmosphere was subdued with music that was a little too loud and a giant television at the entrance that increased the noise of the room that felt simply unnecessary. It felt cold and industrial with many grey walls and, stone and iron work. We were sandwiched between the bar and unattended ceviche counter. The only pops of color noted were the yellow chairs and purple napkins. Enough time had passed that we were setting odds on what would happen next... We'd be moved, a waiter would appear or we'd walk out? Smart money was on our departure. With our patience depleted, we left. There are too many options literally steps away to continue to waste our time. The food could be delicious. I may never know. We had record heat in Las Vegas this week. 117, baby! 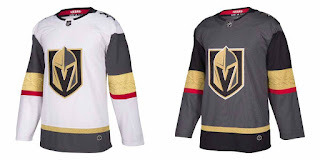 With the rising temperatures you might not consider it sweater weather, but given all the news this week with the Vegas Golden Knights it is indeed. Not only were the team uniforms unveiled this week, but our team grew from three to forty thanks to the expansion draft. The entry draft happens tonight. The season schedule was also released days ago. People instantly flocked to the interwebs to book trips to see their favorite team face the newest team in the NHL. The puck will officially drop in the T-Mobile Arena on October 10 when our Golden Knights vs. the Arizona Coyotes. 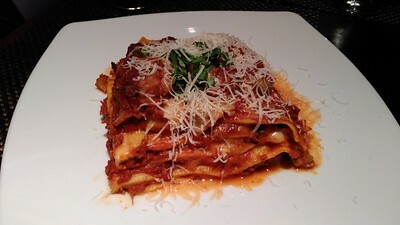 We met friends at Allegro inside Wynn for our second Restaurant Week meal. We had dinner reservations at 5 o'clock. 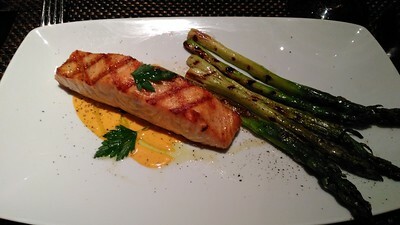 We've dined at Allegro before a few years ago, and several times before that when it was Stratta. 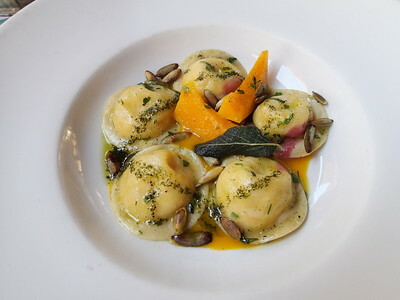 Last visit, I missed Alex Stratta at the helm, but this meal was a pleasant surprise. It exceeded my expectations. Service was attentive, cocktails and each of the three courses were expertly prepared and quite tasty. 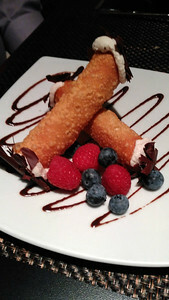 Allegro's Restaurant Week menu was $50 and we sampled most of the dishes. It was only the clams casino we did not try. 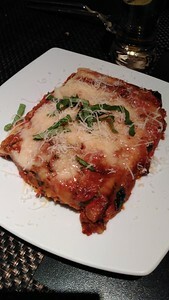 The real standouts were the breads that got us started, the housemade burrata and eggplant parmesan. Those alone were a meal in itself. 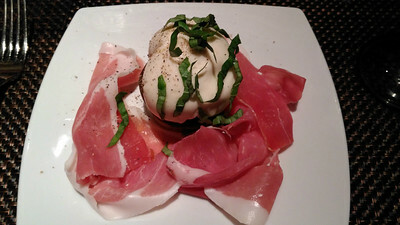 The burrata was perfectly creamy and the eggplant parm was flawless. I thought the lasagna to be the weakest link as it was a bit too acidic for my liking, but it only a matter of preference. Truly everything was delicious. It had been ages since I've been to Wynn, I had forgotten just how beautiful all the little details are throughout the casino. If you prefer not to wander, Allegro is located right off the parking garage corridor and very easily accessible. No parking fees until August, too. A definite perk. My favorite time of the year is upon us. Yes, I am referring to Restaurant Week which benefits the Three Square Food Bank. This year the event runs June 19-30. We have several meals planned with friends and family. I always like to try new places and old favorites. 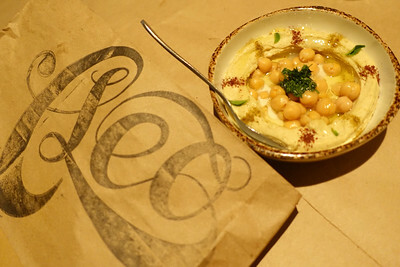 We kicked off our gluttonous frenzy at Cleo, it remains my favorite restaurant in all of Las Vegas. Rumor has it that it will close after SLS sale is complete. It is devastating if it's true. Please don't make me #savecleo. We had friends join us on Monday evening, it was their first time and they enjoyed the spread. They sampled everything listed on the $40 Restaurant Week menu. I had the hummus, brussel sprouts, greek salad and garlic shrimp. 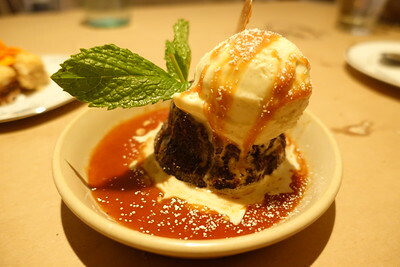 Followed by the sticky toffee pudding for dessert. Frank strayed and ordered from the regular menu. He wanted spicy cigars, lamb shawarma and preferred to skip dessert. The meal was fantastic as always. I simply cannot say enough good about Cleo. If you have the opportunity do check it out. There are some aspects of adulting that I loathe. So, I'm always looking for ways to simplify things I don't like doing leaving time for more of what I love. Cue, Sunbasket! 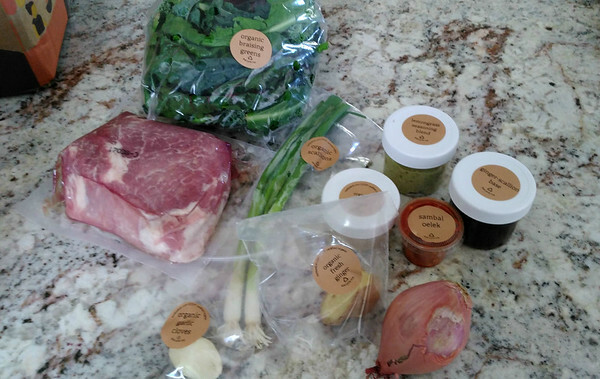 It is a weekly meal kit subscription, there are so many out there now, but this one has organic ingredients and a paleo meal option. A combination that is definitely more rare. 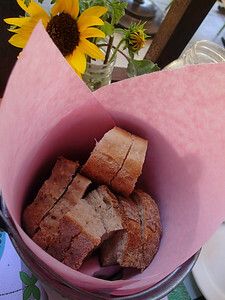 I'm not on a Paleo diet, because, um, carbs, I love them. Cheese is likely my next favorite food after bread. It's just not realistic. However, I don't mind reducing carbs and sugar. It's definitely something I look for when cooking at home since Frank is diabetic and all. 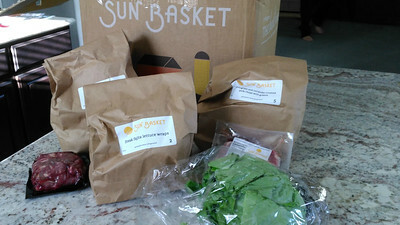 Sunbasket doesn't require you to stick to any particular meal plan. I enjoy that freedom. I'm mindful of carbs and sugars when selection my menus for the week, but even some of the pasta dishes use a healthy dose of veggies so it helps balance things out. My biggest complaint would be the meals were rather steep on the calorie counts, though, that's to be expected when the meals are protein heavy. They have recently rolled out a lean plan for those counting calories. I've not yet tried any of these new menu items. As much as I love Sunbasket it's not practical right now in Las Vegas. It's simply too hot! 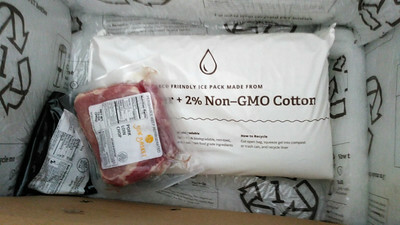 The kits are shipped overnight in an insulated box with an ice pack, but most often I'm not home for my delivery. When it's 100+ it's just not ideal for perishable items to be driven around all day and/or left on the porch. It did work beautifully all spring, though. I fully intend to pick it back up once the temperatures decline. Eating food is a passion, but shopping, prepping, cooking and cleaning is a chore. 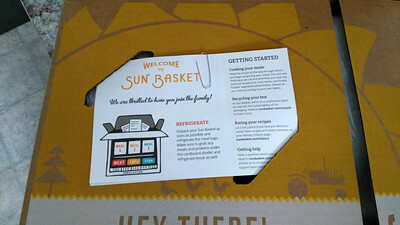 Sunbasket simplifies those duties. 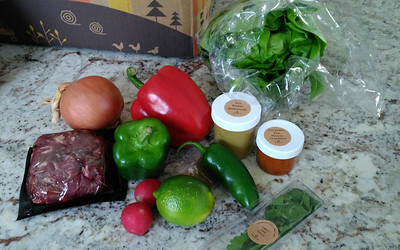 All of the items needed to prepare the meal are shipped to your door. Only exception are pantry staples like oil, salt and pepper. I love this, because more often than I like to admit, I forget one key ingredient when grocery shopping. Often, I end up not making the dish and other items spoil before going to the store. The need for grocery shopping is not completely eliminated, but I could easily skip a week or reduce my time shopping on a weekly basis. Often the prep work is done for you - those are heaven sent. Salads and the like have more chopping and if your knife skills aren't developed it can take far longer than the recipes suggest. Most recipes require minimal dishes and short cooking time. Many are prepared on the stove top. You can read a full description when choosing your menus for the week. Which is helpful, if you're wanting to avoid turning on the oven, etc. Each week there a new menu is posted with nearly a dozen options. You choose as many as three or as little as two meals each week portioned for two or four depending if you select the classic or family menu. If you're having a dinner party you can order one choice for a party of 4 or 6. 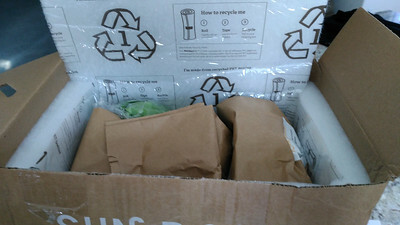 All the packaging is recyclable too. The vegetables are fresh and the meats are pretty good quality. I wasn't personally a fan of the shrimp and I've found the sole portions to be small. Aside from those seafoods, I haven't had any complaints. The pork dishes have been a favorite. 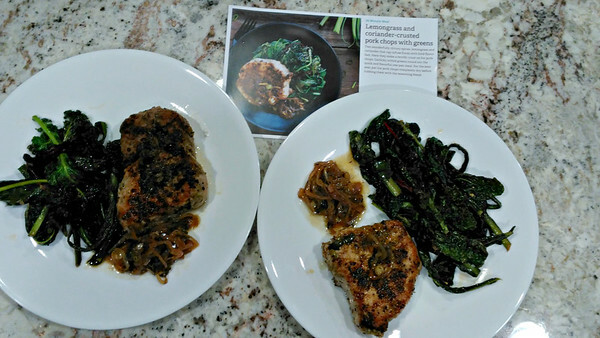 We also really enjoy recipes that call for lemongrass. You can get $35 off your first delivery using my referral link https://sunbasket.com/3free/Kellee560998. You can cancel or skip meals at your convenience. It does require you to log in at least monthly to create your schedule or shipments will auto-fill. The photos below will give you an idea of how the shipments arrive and the contents. 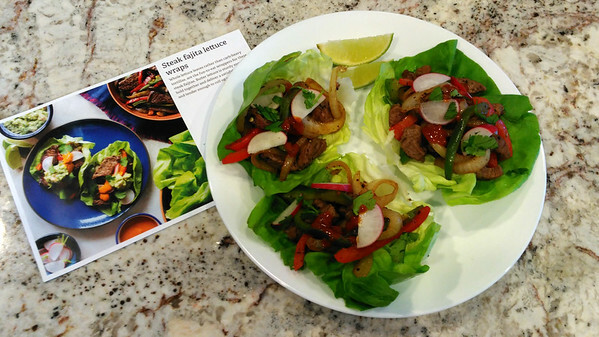 The very first meal I prepared was Steak Fajitas Lettuce Wraps. It was easy to follow the instructions. The meal came together in a jiffy and the portions were good sized. It satisfied our hunger with no need for sides or extras. Great flavor to boot. It was a great first impression. On our final day in Baja Sur, we drove from El Pescadero to San Jose del Cabo. The drive takes about 75 minutes via a toll road. Just before the toll booth there was a group outside their vehicle that flagged us down. A chinese man approached the window and spoke to us in spanish. I didn't understand more than his friend and the airport. I explained that our spanish isn't very good, he urged his friend over since she spoke english. They were headed to the airport from a city a couple hours away, and they only got as far as the toll booth due to a flat tire. She had a flight to Los Angeles in an hour and needed a ride to the airport. It was only a little out of our way so we offered to drop her off. She hurriedly said goodbye to her friends, grabbed her suit case and hopped in the backseat of our Jeep. We chatted on the way and learned she lives in LA and works as a waitress at a popular hot pot restaurant. She enjoyed her stay with friends, but thought it was very hot. They are enjoying their time working in Mexico, but miss a variety of greens and vegetables. Particularly, bok choy. However, brief, it was nice getting to know her and we were happy to help her out. We got her to the airport with minutes to spare. She told us to call next time we were in LA. 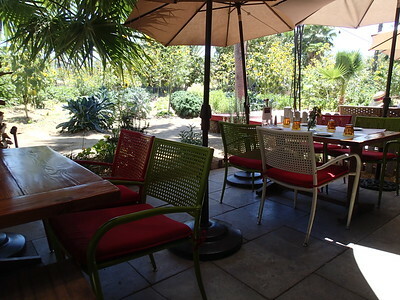 With our good deed out of the way, we were off to our planned destination which was lunch at Flora Farms. It's popular with foodies and celebrities, it gets a lot of press. Every piece I've read written about Cabo seems to mention Flora Farms. I had to go see what the fuss was about. Dinner requires reservations and they are suggested for lunch. However, we like a gamble and showed hoping to be seated. Thankfully, it wasn't a problem. They led us to a table right away. 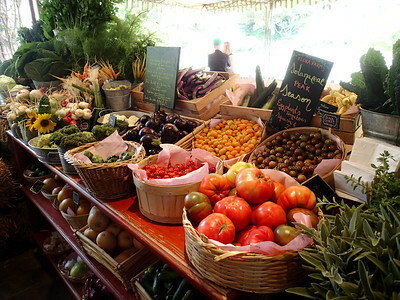 Flora Farms is more than a restaurant. It is a working ten acre organic farm. There is the farm, of course, and the restaurant. Also, there is a bar, shops and grocery onsite, along with culinary cottages living spaces (owner's have harvesting privileges), plus multiple event venues. It's quite the operation, but THE BREAD. Swoon. The bread was worth the trip alone. If I could eat it all day and night, I'd die a happy woman. The menu is drool worthy. 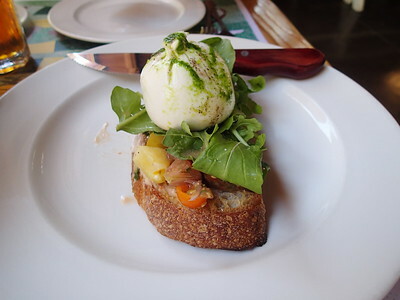 We started with housemade burrata which was just as good if not better than what we had in Italy. 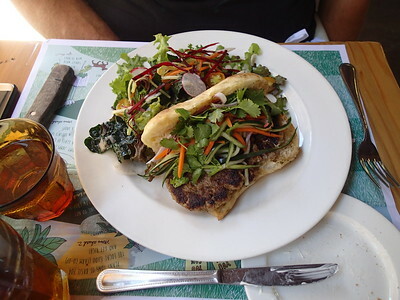 We followed that up with butternut squash ravioli and sausage sandwich with pickled veggies which was reminiscent of banh mi. It was a lovely lunch and I'd be happy to stay all day, but we had to return the rental and catch a flight home. Everything went smoothly, except that Frank was denied his butane lighter at security. His cigar accessories are never a problem leaving the US, but returning they're always confiscated when we don't have checked baggage. Lesson learned. Our connection in Phoenix was a breeze, though, longer than we'd prefer. I cannot say enough good things about Global Entry. It is super convenient and it saves so much time. Well worth the money spent. Baja gets a bad rap, but we encountered no ill will in any of our travels and we never felt threatened. Getting trapped in the sand was only concern and friendly locals came to our rescue. Despite what the media portrays, I firmly believe that in most cases trouble only finds you when you go looking for it. Sure, you can be at the wrong place at the wrong time, but freak things can happen anywhere. Don't fear the chupacabras. Go! Have an adventure and relish in the beauty.